I wanted something that I could possibly refinish in the future, but they had to be presentable (and functional!) now. 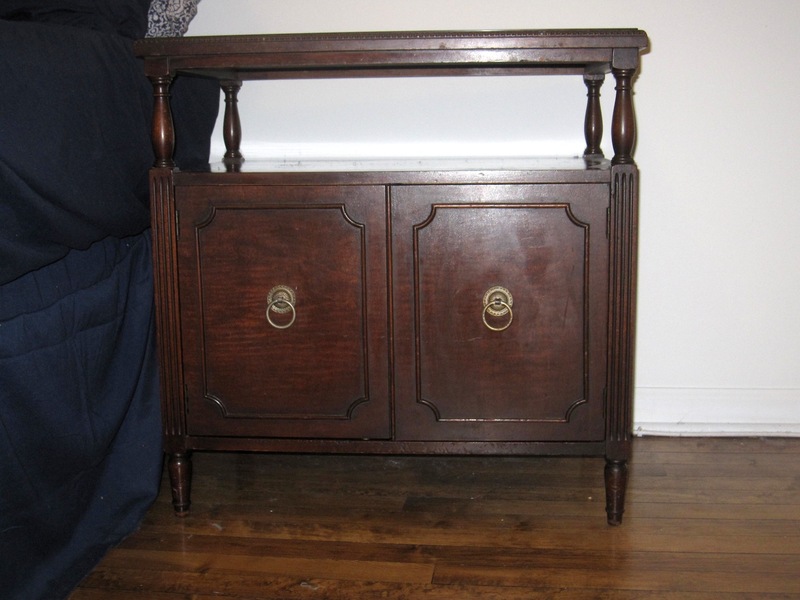 I fell for a pair of old record cabinets – there’s even slots at the top of the cabinet part to keep the records in place – but they work magically as nightstands. Perfect height. Plenty of storage. Great shape. $100/pair? Sold. SO, a lot has happened since my last entry, but I’ll just start with this past weekend. I went with my kickball friends up to Traverse City, Mich., for Liz’s 30th birthday. We rented this great house on Silver Lake and got a limo to take us around to the wineries on Saturday. I’d never been to a winery! Can’t say I’m a big fan of reds, but luckily Michigan is known for it’s whites. I ended up not buying any bottles of wine but rather hard cider. Very excited! Plus, I think we hit Michigan at it’s peak for fall foliage – the drive was just beautiful.